My little sister's birthday is on the 13th,and I made some pizzelles and mailed them to her because she loves them, and I love her! I saved a few to enjoy with a cup of tea. Happy Birthday, Amy! My sister sent me this Gracie teacup for Christmas. Isn't it pretty? It's navy blue and light blue with gold trim . Can you see the toile design inside the cup? I love surprises like that! 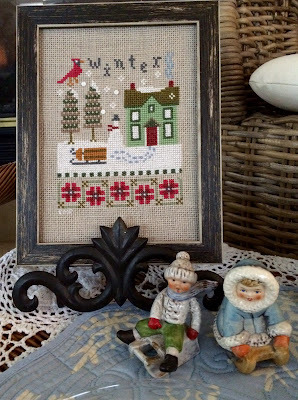 My Lizzi Kate Winter cross stitch design is finished and looks cute with my Goebel sledders, given to me from my dad, back in the late 1970's. For my pizzelles, I used this recipe that I shared before, but this time I took the advice of Lynn, from Happier Than A Pig In Mud, and added three tablespoons of cornstarch to the bottom of the 1 cup of flour, which makes the pizzelles light and crisp. I thought about decorating the pizzelles like snowflakes, like Mary, from Home Is Where The Boat Is, did here. However, I didn't think that the pizzelles would stack as well to pack. This beautiful hawk has visited my backyard 8 times since my beloved hubby passed away, and three times since December 29th of this year. The very first time that the hawk visited was on the Christmas Eve after Rich passed away. The hawk will stay perched on a branch for so long, just hanging out and facing into the window. The tree is an East Palatka Holly tree and is an evergreen, with pretty red berries in the winter. Your birthday treats for your sister looks so yummy. I love the snowflake design. That hawk is enjoying your holly tree! I love my sister too. I think she owns a pizzelle maker. I think I will borrow and make her a birthday present. Love your tea cup. 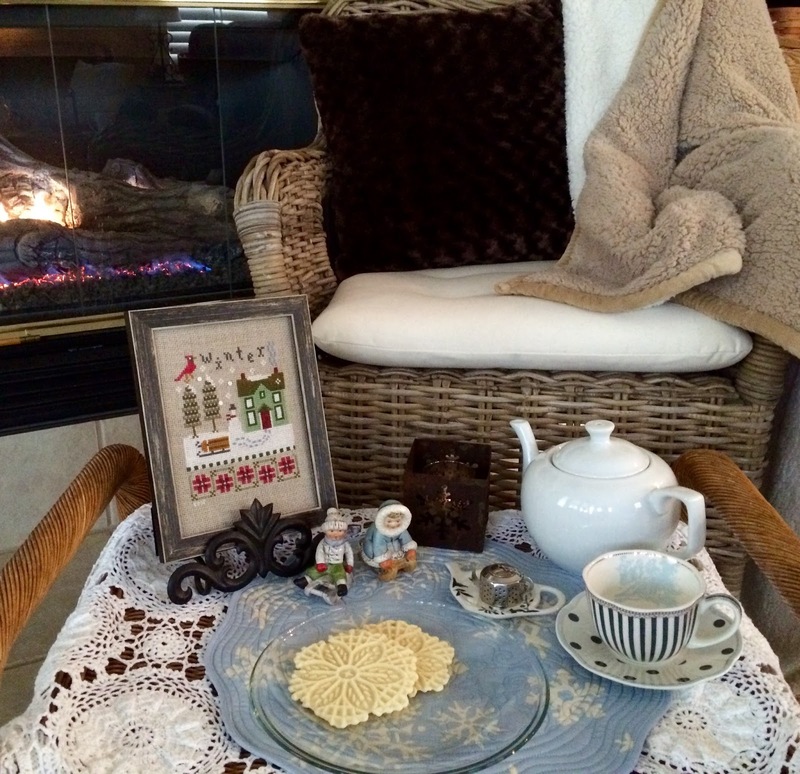 You create the most cozy vignettes! The gift must surely have made your sis smile. I am also glad to see that you do some winter decorating, too. Makes me feel a lot better! Hi Kitty, what a lovely tea post this morning. Love seeing your pizzelles, as you know I also made them this year. Looks like you have a smaller iron with pretty design. I bet your sister loved them. What a special birthday gift. 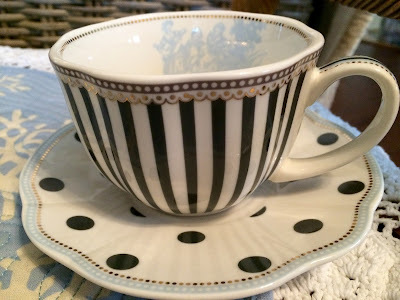 Your teacup is gorgeous and I love the toile design inside. Oh how precious your cross stitch is with the sweet figurines from your dad. Treasured gifts for sure. Your stitch work is beautiful!! I believe the hawk is a sign from above. After my parents both passed away, since the day my mother left for heaven, 2 mourning doves have sat on our fence looking into the kitchen. That has been nearly 16 years now. They still come each day. How nice to make these cookies for your sister for her birthday! I love the teacup, cross stitch and the figurines. Thanks for sharing at Cooking and Crafting with J & J!! Oh my, these look so pretty! The cross stitch looks great too. It has been ages since I did one, but really used to enjoy them! Love the cross stitch, and also your whole setting. Your plate is pretty, I like the sledders and the little tea bag caddy. Your pizzelles look pretty too. Enjoy your week, Kitty! Beautiful cookies, Kitty. Your sister must have been so happy to get them for her birthday. I love your story about the Hawk. I think that is sweet. Your pizzelles are so pretty and I have never made them even though I have had the "form" or whatever it is called since the 1970's. Time to do this - right! So glad you linked! What a wonderful thing for the hawk to show up like that so often and the tree is beautiful! I have never tasted pizzelles. They really are pretty and so perfect for the wintertime because they resemble snowflakes. When I worked at the jewelry store we sold Goebel ornaments and I always wanted to collect them. Back then they were very pricey so I never did collect them although I did gift one to a friend once. Love your pretty teacup and the toile inside is a sweet surprise! Thank you for sharing, my friend. My aunt used to make Pizzelles every holiday season. They were so good! Yours look lovely, and I bet your sister was happy when she opened the package. I totally believe in miracles in nature which connect us with those who have passed. Everyone says when a cardinal visits your yard or feeder, that it is someone who passed visiting. I carry on conversations with every cardinal I see in the yard. The other story I have been told is whenever you find a feather in your yard, it is a loved one who dropped it there for you to find so you know you are being thought of by those we have lost. I think your hawk story is an amazing one. God, through the nature around us, continues to work in mysterious ways. We have to believe in miracles and accept them when they are offered. Also, your tea cup from your sister is stunning and so you :) Have a blessed week, Kitty. Much love and tender hugs! Kitty, I've never tasted a pizzelle before. They look so fragile and beautiful. I can see the sweet toile inside the teacup peeking out. What a beautiful hawk. What a gentle reminder of love. Your little sister is the 3rd person I know celebrating her birthday on the 13th. Did your beautiful pizzelles make it intact to your sister's place? Love your new Gracie China teacup, especially the toile design inside the cup. So pretty! What a sweet and pretty gift. 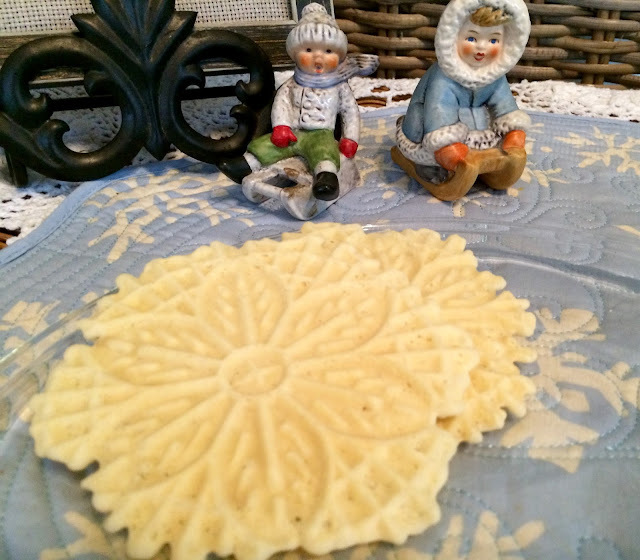 I wish I had a pizzelle maker. Sisters are special. I 'm sure your sister felt special you would go to so much trouble for her. I know you miss your husband especially this time of year. Blessings to you today. Pizzelles are such pretty little treats. How clever of you to make them for your sister. The teacup is a very pretty one. A hawk keeping you company is a very special thing. God sends comfort in many, many ways. I'd love to receive some Pizzelles in the mail! They are so pretty decorated as snowflakes. Love your new teacup. Very pretty with the toile design on the inside. The hawk is a very special messenger. Happy Tea Day! what a pretty setting. For some reason I have never tried to make Pizzelles. They look so good! Lovely gift! The teaup is really delicate and pretty. These are such beautiful and delicate cookies. I remember seeing them first when I was just a young girl but haven't seen them in years. They look delicious! Kitty, your pizzelles are so pretty, your sister is going to love them! Isn't it especially nice when a teacup has a design inside the cup? How fun! I used to have a pizzelle iron...don't know where it is. The teacup is so pretty, especially the interior. And I adore your new cross stitich....I need to finish a few...you've inspired me! Thanks so much for linking to Tuesday Cuppa Tea! Kitty, I love the new teacup, with the pretty blue design inside, and how you used it as the inspiration piece for a lovely tea table. The pizzelles look so pretty and delicate, just like snowflakes on your plate. I've actually never had one! Will have to remedy that! Your heading has put a smile on my face, it is so bright and cheery. Those pizelles look delicious. What a gorgeous teacup, I love the toile peeking from inside. Your cross stitch is pretty and looks perfect sitting there with your sledders...they are very sweet. How interesting about the Hawk; he is obviously keeping a friendly eye on you, Kitty. Love your sweet winter tea, Kitty. 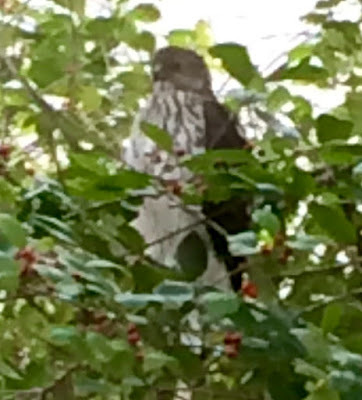 I believe that hawk is a special visitor. ;-). Decorating pizzelles to look like snowflakes. Blows my mind. Really, it does. Half the time I don't frost things that should be frosted. My bad. Gorgeous stitching, love the stand you have it on also, it does go so well with your figurines! We have hawks come around here every once in awhile too, they are so amazing! I always make these at Christmas, but will have to try the tip. I am not a fan of anise, so I use a different recipe. My family loves them too. Happy New Year. Your new cross stitch turned out lovely! And your new tea cup from your loving sister is beautiful. I saw that tea cup earlier in the season and also loved the surprise toile on the inside. I got all teary when you spoke of the hawk. Bless you, sweet friend, for sharing this wonderful post with Roses of Inspiration. It's always a pleasure to have you at the party. Much love! Hi I love pizzelles, And the hawk visiting is very interesting! Hawks ar very majestic. Hope you are well! I too, love pizzelles! What a lovely gift to send to your sister! I have always wanted to make these! Your new teacup is so pretty. 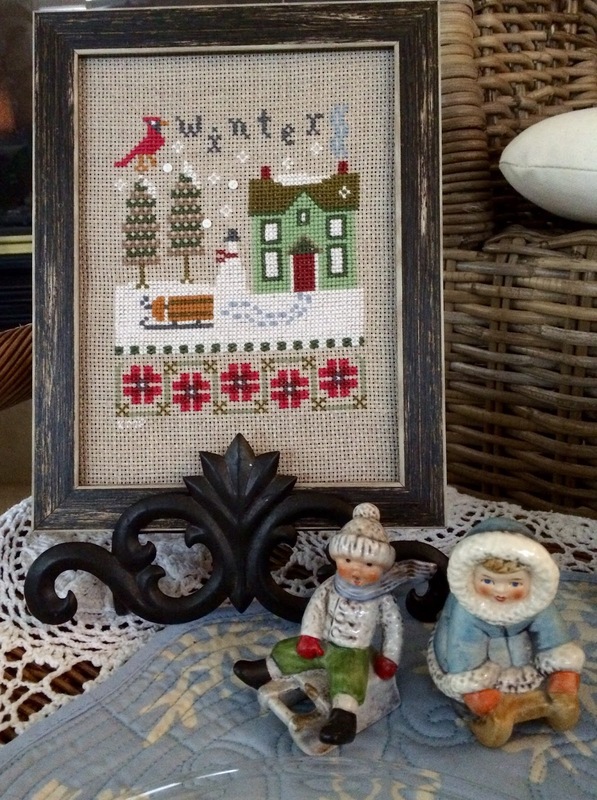 I love your winter cross stitch too! Love that the hawk pays you a visit and keeps his watchful eye on you. How comforting! I don't think I've ever had a pizzelle...maybe I should invest in a pizzelle maker.. I love that the hawk is visiting you regularly. And, I love pizelles. Someone made them for our New Year's Eve Progressive Dinner and I must admit that I ate more than one. I am going to pin the recipe and give them a try. What a dear post that pulls my heart strings. Your sister is a very blessed lady to have you for a sister and your Birthday Pizzelles look wonderful. There is no doubt that you have a heavenly visitor and you sure know who HE is. Hope you are having a great day and thanks so much for sharing with Full Plate Thursday. Love, love the tea cup and saucer! Your cross stitch is beautiful. I think I mentioned earlier that I used to do a lot of that but my eyes just won't allow it now. The Pizzelles look so pretty and I'm sure your sister was thrilled! I think a gift that is handmade and from the heart is the best. I've never tasted them nor made them so this is interesting to me. I feel sure that the hawk is a gift ~ a very heartwarming gift ~ for you. I love the signs that our loved ones send us from Heaven. It just feels so special doesn't it?